About a year ago, the children wanted to know more about Ancient Greece and Ancient Egypt so we spent a few weeks on this topic using various resources. But I wanted to find a way to consolidate and wrap up what we had done and thought lapbooks would help us pull everything together. Since then we have put together lots of these books, and always find something new and interesting to do when making them. A lapbook is a large book made by the children, with lots of smaller booklets inside it - each booklet covering a different topic or area within the main subject. So, for example, an Ancient Greece lapbook may have booklets on the Olympics, the Parthenon, Food, slavery, Architecture and Art (to name a few!). You can either get the children to make a lapbook each - or combine their efforts to make one together. You are aiming for something like Egyptology - a book with lots of pull out sections, flaps, envelopes and pockets. Lapbooks provide a really fun, hands on method of pulling information together. It will get the children researching their topics and organizing the information (by booklet). It works well with different learning styles and ages/abilities because you can tailor the lapbook to the child. Got a 'list-maker'? - a lapbook is a perfect way of pulling together statistics about a topic. Got an 'arty' child? 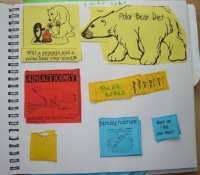 - you can make your lapbooks beautiful. Got a preschooler? 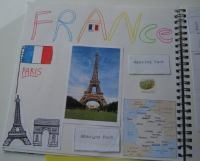 - put lots of coloured pictures and drawings into the lapbook. One of the things I really like about lapbooks, is that I can keep work-time down to short sessions. Each small booklet won't take too long to make. So I can use lapbooks well with WorkPockets or 1 Hour Homeschooling. The easiest way to get started with lapbooks is to download a free template and work with that. I have a separate page for lapbook resources that we have used or found useful. You first need to decide on a subject for your lapbook. Print out some images and book templates. When my children were small I made up the booklets ready so all they had to go was draw or glue images into them. Now they see making the booklets as half the fun! but you are limited only by your imagination. Make a lapbook display board. Instead of sticking your little mini-books into a folder, pin them to a corkboard, or a large piece of card. This gives you lots of room and gives you a great display. Use a large book. After making several lapbooks I found it difficult to store them neatly. We now lapbook into a large 'art' book with a spiral binding. Sometimes we fold pages down to use as our lapbook - and sometimes we work across the whole page. Use bookmarks or sticky post-it notes to divide the sections between the books. Make a display table and use small boxes instead of books to display information. Or try something like my nature table. Use a large box - decorate the outside to match your subject, then use it to store the booklets and other relevant items. Make a PC version - set up a website or blog with 'links' down into the sub-sections. Make a fabric version - put pockets on a quilt (or doll) to store the booklets. You can write on fabric with a permanant marker pen if you want to make a totally fabric version. Hang each booklet along a ribbon or piece of string, and hang in the room. Got Teenagers? 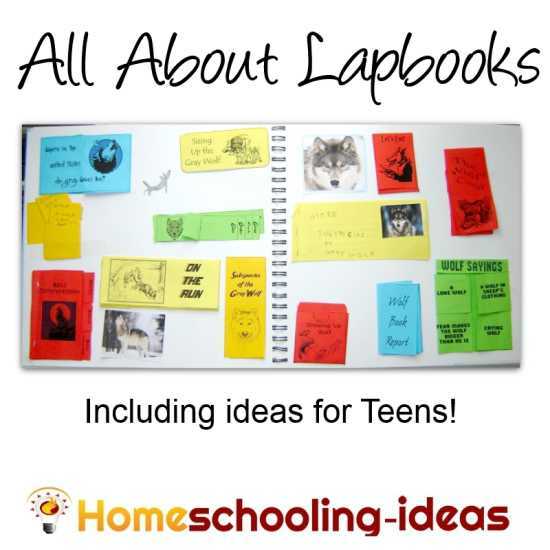 Lapbooks may be for the younger crowd but there are lots of ways to do similar projects that would appeal to teenagers. Notebooking is popular, and there are several free downloads of notebooking pages on the internet. Educational Scrapbooks are a fun way to do a project with an older child. Use them as learning journals or project scrapbooks. 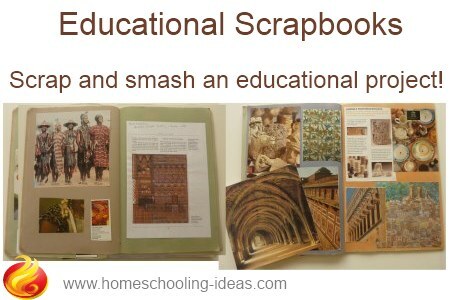 Find out more about educational scrapbooks here. 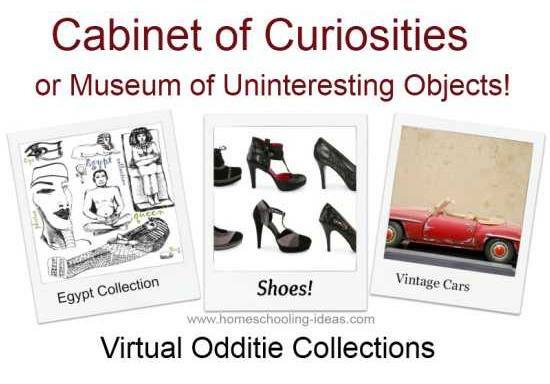 Another idea is to make a virtual cabinet of curiosities. Get your teens to plan their own collection of curiosities. They could research unusual and interesting ideas, quotes and facts. We have had enormous pleasure making our lapbooks. I hope these ideas get you started in a whole new world! Check out my ideas and resources for homeschool timelines. Looking to be more creative in your homeschool? Here is the place to get homeschooling ideas.